A 20-year-old woman convicted of punching and stomping her baby daughter in December 1997, and waiting three days before seeking medical intervention, yesterday apologized and asked the court for another chance. "I'm sincerely sorry for what happened to my daughter," a sobbing Jennifer Edwards told the court. "I live every day knowing I won't see her again." Despite her plea, Circuit Judge Marie Milks sentenced Edwards to 20 years in prison for reckless manslaughter, with a mandatory minimum of six years and eight months. Because Edwards has been incarcerated since December 1997, she could likely be released in about four years, said deputy public defender Ed Harada, who indicated he will appeal. It will be up to the Hawaii Paroling Authority to decide how much time she will actually serve. Harada, who described Edwards as intelligent with much potential, said she was "saddened and disappointed" in the court's ruling. for reckless manslaughter in the death of her infant daughter. 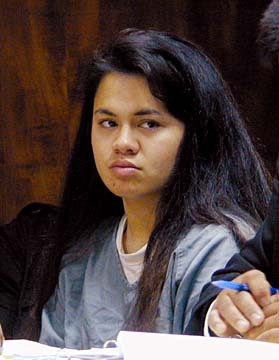 Harada had sought either probation for Edwards or that she be sentenced to a maximum eight years under the youthful offender statute. The state will request that she serve at least 15 years. After the sentencing, Deputy Prosecutor Lucianne Khalaf said Edwards continues to portray herself as a victim and minimizes her role in her daughter's death. "She's asking for a chance she didn't give her own daughter," Khalaf said. "I don't believe there's a dramatic change or genuine remorse for Cedra's death." Jennifer Edwards had admitted to police to hitting and stomping on her daughter, but later testified during trial she made those statements because she had been threatened by her boyfriend Mika Mika Jr., Khalaf said. While Edwards was initially charged with second-degree murder, jurors in May found her guilty of the lesser charge of reckless manslaughter because they could not find that she "knowingly and intentionally" caused the child's death, as required by the murder statute. Jennifer's mother, Renita Edwards, said her daughter wasn't the only one responsible for Cedra's care, and will lobby for a law here that holds all adults within a household accountable for a child's welfare. Jennifer took Cedra to live with Mika despite her parents' attempts to get her to move back home. But since she was Cedra's natural mother, Edwards had a duty to provide proper care for her daughter, Harada said. Nevertheless, based on the evidence he presented at trial, "(Mika) was more culpable, and by a fluke of the law, he avoided prosecution," Harada said. Khalaf said had there been evidence to support Mika did strike Cedra, "he most definitely would be charged." In other jurisdictions, Mika would have also been held responsible for Cedra's injuries. But he is not Cedra's natural father and did not owe the child a duty unless she was left in his care or the mother could not care for her, Khalaf said. In court, Renita Edwards said although she wanted nothing to do with her daughter for nearly six months after she was arrested, she loves her daughter and supports her. "For a long time, my heart was cold to her because I couldn't understand how she could have done this to Cedra," she said. Cedra Edwards is among several child abuse cases in the past three years, which have subjected the Department of Human Services to much criticism for focusing on family reunification. Since her death and the August 1997 beating of Reubyne Buentipo Jr. by his mother, Kimberly Pada, a state law was passed emphasizing a child's safety first before family reunification. Buentipo, who suffered permanent brain damage, remains in a vegetative state.